“Scenes of Provincial Life” would be an apt title for an account of the 2013 New York art world, a white-bread band going about its practiced rounds. Galleries pushed painting: schooled, skilled, dull. Marquee items that went on view in museums only mildly thrilled or chilled. The Metropolitan Museum of Art’s peak moment was a decorating job: reinstalled European painting galleries that had a slow-burning splendor. MoMA clung to West-is-best in an abstraction survey that didn’t budge beyond Euro-America — North America, that is. The Guggenheim’s rotunda, with back-to-back James Turrell and Christopher Wool solos, has felt more or less empty since June. Like all insular communities, the art world is a consensus culture. Week after week, the same people say the same things about the same shows. All surprises are in reality predictable. In 2013 the auction houses did what they are programmed to do: get ever more cash for ever-crummier art. (Francis Bacon paints Lucian Freud. There’s a dreary duo.) And the rest of us played our scripted part — gasping, cheering, jeering — to keep business strong. Still, there were memorable breaks in the flow of events. A dozen follow. ‘Paul McCarthy, WS’ Installed in the drill hall of the Park Avenue Armory, this ambitious Dante-esque gross-out consisted of seven hours of film surrounding a full-size sculptural ranch house and a sequoia forest. Blood, excrement, alcohol and M & Ms flew through the air as Mr. McCarthy took down targets ranging from Walt Disney (“WS” stands for Snow White backward), himself (the ranch house was a replica of his childhood home) and America’s lust for bigness and waste. Some Armory visitors fled from the scene. Others, like me, stayed around. Ninth Shanghai Biennale This show, which opened in October 2012 and ran well into 2013, was big, set in a former power plant. When it was over, the building was turned into a permanent museum of contemporary art, joining several new private museums in town. Still more have popped up since. In China these days, art equals power in ways we barely grasp. To watch that power accumulated before your eyes and museumized overnight is like seeing the New York art world reflected, at fast-forward speed, in a fun-house mirror. ‘Medieval Treasures from Hildesheim’ Small, but this exhibition (through Jan. 5) automatically makes the Met one of the most potent spiritual-power spots in the city. The objects — religious sculptures, liturgical vessels, a bronze baptismal font — are, aesthetically, among the great surviving treasures of Northern European Christendom. More than that, they are soaked in the sanctity of centuries of devotional use. You can feel their heat from here. ‘Steve McQueen’ One of the year’s strongest museum solo shows, although it made it just by a squeak, closing in early January at the Art Institute of Chicago before heading to Europe. (That it didn’t stop in New York seems nuts.) A retrospective for a brilliant British artist at midcareer (and the director of “12 Years a Slave”), the work is visually rich and politically goading. And if you ever wondered how films could be turned into objects for gallery display, here’s your answer. ‘Dancing Around the Bride: Cage, Cunningham, Johns, Rauschenberg and Duchamp’ This exhibition at the Philadelphia Museum of Art offered a curatorial object lesson of another kind: how to bring art, music and dance together, just as the figures listed in the title did more than half a century ago. The mix worked. Enchantment. ‘The Encyclopedic Palace’ This presentation, organized by Massimiliano Gioni of the New Museum in New York, was the centerpiece of the 55th Venice Biennale. It was carefully thought out, masterfully paced, often moving, but flawed. It paid homage to the recently intensified fetishism surrounding “outsider art,” which has always been the mainstream art world’s acceptable version of identity art. “Outsider” is a complicated label; it can easily lead to the exoticizing and primitivizing of art and its makers. It did in this show. ‘Blues for Smoke’ Coming to the Whitney Museum of American Art from Los Angeles, this show might have gone the route of the Venice centerpiece, but didn’t. It took a potentially “racial” theme — blues as music — and flexed and stretched it to include artists of various ethnicities, sexualities, generations, dispositions and disciplines to define a state of mind. The expansion worked subtly, beyond category, and for that reason, grippingly. ‘A Different Kind of Order’ The International Center of Photography’s fourth triennial show and its best so far. The goal was to acknowledge that photography has been utterly transformed by digital technology and to demonstrate that in the work of two dozen fantastic international artists. Importantly, the curators didn’t regard that change from a distance. They approached from inside, as a done deal, with belief. ‘Jay DeFeo’ Further evidence that the Whitney Museum of American Art was having a good year with a succession of offbeat exhibitions. DeFeo (1929-89) lived most of her life in and around San Francisco, where this retrospective originated, and had close ties to the Beats. She is best known for a single work, a monumental relief painting called “The Rose.” But the show, like DeFeo herself, seemed indifferent to “greatness.” It told the story of one person’s life in art, not an easy life, but one lived with love. 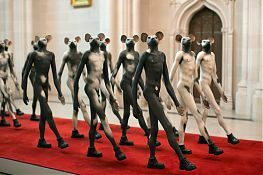 ‘Jane Alexander: Surveys (From the Cape of Good Hope)’ This show, at the Cathedral of St. John the Divine, had the advantage of appearing in a charismatic non-art-world environment, and lived up to it. Born in Johannesburg, Ms. Alexander has for years been creating sculptural figures, part-human, part-beast, to dramatize the existential purgatory that is modern South African politics. Arranged in tableaus in the cathedral’s chapels, they looked like beings from another world and emanations of a collective psyche. Ernesto Pujol, ‘Time After Us’ This one-day performance also took place outside the art world, at St. Paul’s Chapel in Lower Manhattan, which, in 2001, was a refuge for emergency workers responding to the attacks on the World Trade Center. The event had 24 performers — dancers, actors and visual artists, along with Mr. Pujol — and lasted without a break for 24 hours. Silent, dressed in white, the participants simply walked counterclockwise and backward in an expanding and contracting circle in the center of the church. No spectacle, no props, no expense. Viewers, most of them tourists visiting ground zero, wandered in from the street. Many lingered. I had planned on a quick trip but stayed for two hours. I was in a sense still there when, just before falling asleep in my apartment late that night, I remembered that Mr. Pujol and company were at that very moment still in the church silently circling. I loved that. Detroit Institute of Arts I hated the news coming in throughout the year, like a bad dream, of the threatened dissolution of the Detroit Institute of Arts. Detroit is broke. Creditors are pounding at the door. The institute, one of the country’s great old museums, has a valuable collection, a chunk of which the city could possibly legally sell. That such a move would even be considered is a civic outrage, a trashing of the city’s future to plug some holes in its present. If it proves that the worst seems about to happen, the art world should get itself out to Detroit en masse and put its communal spirit to good use: Form a human circle around the building and, in one voice, just say no.